A central heating and air conditioning unit warms your house in winter and cools the indoor spaces in hot weather, all from a single component. The wall thermostat controls the switch from heating to cooling. If something goes wrong with the unit, you want a fast solution to identify the problem and arrange for repairs, if necessary. Try troubleshooting the central heat and air system to isolate the issue before the house gets too uncomfortable. 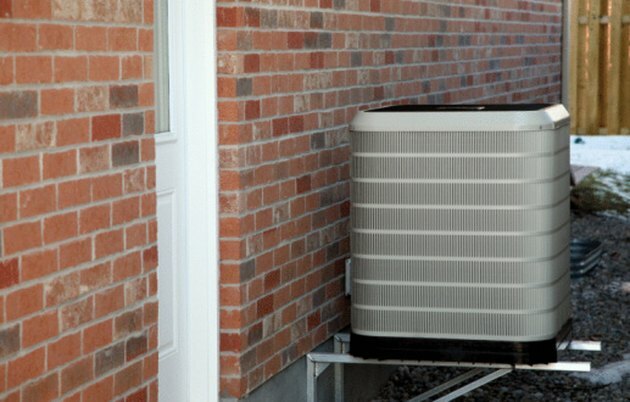 The central heating and air conditioning system runs from an outdoor unit. Set the wall thermostat slide switch either for heating or air conditioning, and adjust the temperature control so it is higher or lower than the displayed room temperature. For example, to test the air conditioning system when the house temperature is 71 degrees Fahrenheit, the thermostat must be set at 70 degrees Fahrenheit or lower for the air conditioning to turn on. Replace the batteries in the thermostat if you have a programmable model and the display is not working. Close the circuit breaker switch for the central heat and air unit to the "On" position if the breaker has tripped. Remove the air filter from the slot in the air exchanger, generally located in a basement. The filter is typically square or rectangular, set in a cardboard frame with wire mesh over the filtration material. If the filter is coated in dust, replace with a fresh filter. Air cannot pass through a clogged filter, which causes the unit to work harder and possibly trip the circuit breaker before your heating and cooling pump can burn out. Move outside to inspect the unit. Water puddles around the base or frost on the condenser coils are signs of a clogged line or a low freon charge, which prevents the air conditioner from cooling properly. These types of problems require repairs by a trained heating and cooling technician. Push the red circuit breaker button near the base of some units to close the circuit if a power surge trips this safety feature and the unit shuts off. Listen for the sound of the fan motor and check for the spinning blades by looking straight down at the heating and cooling unit. If the thermostat is set for heating or cooling, but the fan is not spinning and blowing air upward, or if you detect a sharp electrical smell, the motor may be malfunctioning. The unit will produce neither warm nor cold air if the motor is bad. Contact a repair technician to service the unit.